Did you get in on the Vapid Lacquer restock this passed weekend? There were some stunning things available, and not all of them are LE. One of the new shinies is this lovely, inky shade. I think I am in love. This shade...you guys. YOU GUYS. Why is it that I finally made my little Whovian slideshow and I suddenly start collecting delicious blues and ceruleans and cobalts...I think fate enjoys poking me with sticks. As long as colors like this keep coming my way, I'll allow it. 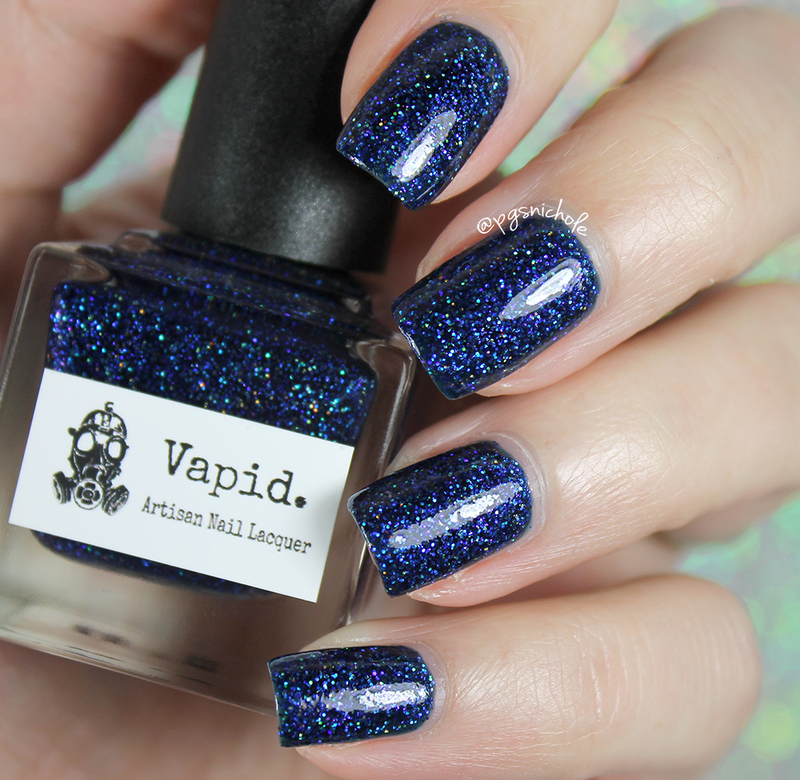 This is a deep royal blue jelly filled to bursting with glitters. 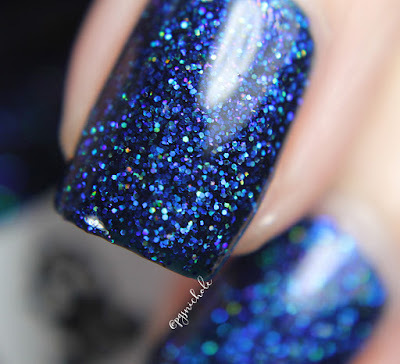 Navy, holo, navy holo, silvery, shimmering aqua...if you can imagine it and it can be made into glitter...here it is. It is a superbly even formula, and I was able to make it opaque in two coats. There was no fussing, dabbing, or praying needed to get the look in these photos. I layered on a medium coat of Seche Vite and I was a happy camper. This was available initially during the last weekend restock. If this caught you unawares, you should definitely join the Facebook group. 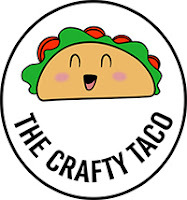 Krys and the Admin-ettes (like a 50s do-wap group) post restock lists, times, and plenty of photos well ahead of time so you can organize your wishlist and set your alarms! Ugh. 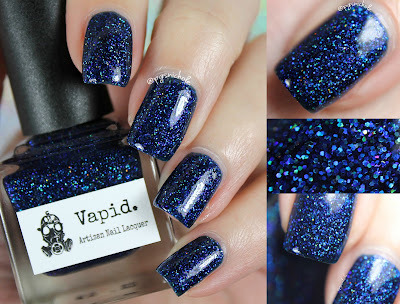 This polish is gorgeous, gorgeous, gorgeous. OMG, how beautiful is this?!? I am helpless in the face of such beauty. Dang it, Nichole! Why you do me like this, eh? Stunning! I know I need this one. GORGEOUS! 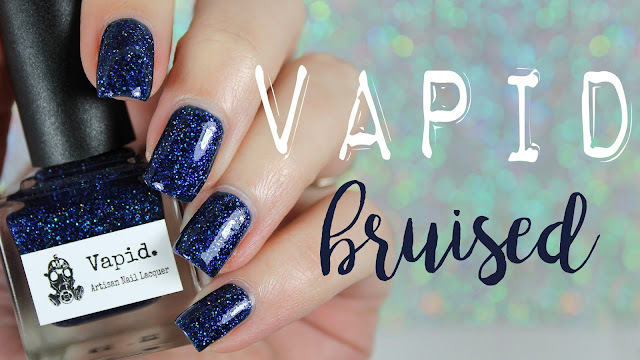 I love sparkly, bold blues like this all year long! Holy ugh. I need this. This is so pretty!! I've actually never used any Vapids, but I love how dark it is! Velvet night sky. Gorgeous! Look at the depth to it! This blue is stunning!! WOW! So happy I was able to swatch this one, it's beautiful! Beautiful! I really want this! Holy goodness!! That is awesome, can't stop looking at those swatches! 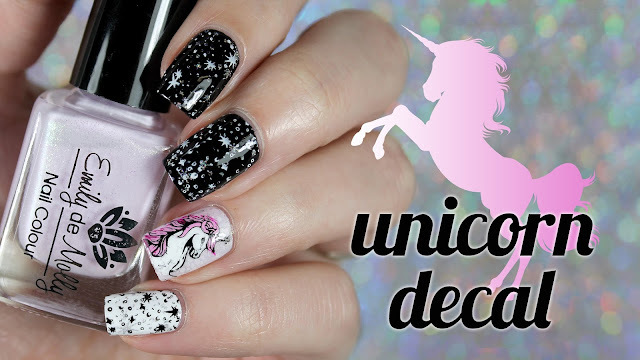 This is such an awesome polish, and I love how the light reflects in the video!